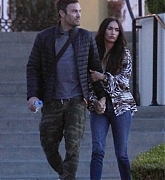 I’ve added new high quality candids photos of Megan Fox arriving at LAX Airport with her husband and son, Noah on April 4, 2013 to the gallery. She look really perfectly with this hair color ! Can’t wait to see her in TMNT.